We are thrilled to share with you Debbie Glade’s interview with science writer and children’s book author, Beverly McMillan. Beverly McMillan is a powerhouse of a science writer with numerous impressive journal and book titles to her name. From textbooks and ocean science journals to her extraordinary new children’s title I reviewed, A Day in the Life of Your Body, Beverly is educating the world in the most wonderful way with her work. In this interview with the author, we get a rare and inspiring perspective of the life and work of a dedicated science writer. You have an undergraduate degree in Linguistics. What made you decide to focus on science writing in grad school? I’d started a linguistics PhD program when I realized that what I really wanted to do was write. I’d always been interested in science, and even thought about medical school, but I wasn’t sure I could handle the required math courses for that, and I was also a single mom with a special needs four-year-old. The Graduate School of Journalism at UC-Berkeley offered a journalism Master’s degree that required students to specialize, and one of the specialties was science writing. That seemed like a way to pursue both my interests, so I applied and was admitted. Does a Master’s in Science Writing require an equal amount of science classes as writing classes, and how long did it take you to earn the degree? My degree is a professional Master’s of Journalism (MJ) with an emphasis in science writing. In grad school I took more writing classes than science classes, though I’d already done some undergraduate science coursework in chemistry and biology. It took me two years, which is pretty typical. Today, the programs in science writing that I know about—and there are several really good ones—generally require students to have a double major in a science and the writing curriculum, or a prior degree in a science. Some science writers have Masters or PhD degrees in the area of science they want to write about. Of course, we also see MDs taking up science writing and broadcast journalism. When and what was your very first paid science writing assignment? The Berkeley G-School required students to have a publishable Master’s thesis, which could be either a longer piece of writing or a broadcast journalism project. I researched and wrote an in-depth magazine piece on wind-powered cargo ships, which was a technology some entrepreneurs in the San Francisco area were pursuing at the time. My piece was published in Science 81, a popular science magazine that had been launched (no pun intended) by the AAAS, the American Association for the Advancement of Science. Today, of course, the AAAS still publishes Science, one of the top scientific journals in the world, as well as a suite of other print and online products. Can you share with us a brief explanation of how the process works when writing a human biology textbook, from research to publication? Usually, an educational publisher recruits authors for books it wants to publish, in part because textbook writing is fairly specialized. The author or authors work with editorial staff to develop a detailed plan for the book, and they write or work with experts in different content areas to develop the initial manuscript and art plan. For my human bio text,which is for non-science majors, I do all my writing using the publishing software InDesign, which lets you work on an electronic version of the actual book pages. Professional artists and technical illustrators create the necessary line art, and we license photographs from stock houses or other professionals. Once the text and art are reviewed by experts and revised accordingly, the publisher manages the production end of things—copyediting, art development, photo research, putting it all into final electronic files, and printing. There are many review and revision steps right up until the book goes to press, because it is so crucial that a textbook be accurate and up-to-date. Do you work with medical doctors and other scientists? I insist that scientists with expertise in the topic I’m writing about review everything for accuracy. Before I sit down to write I also do considerable research in the peer-reviewed scientific and medical literature. I sometimes visit reputable Web-based medical or health sites to get ideas on in-the-news health topics. There’s a lot of good information on the National Institutes of Health websites, and sites of organizations like the Mayo Clinic and the American Cancer Society. How did you come to write A Day in the Life of Your Body for kids? It is unquestionably an extraordinary book. I love this book! A British publisher I’d worked with on the Sharks and Oceans Insiders books and some other projects contacted me and said they had this idea to do a book on what happens in a young person’s body over a 24-hour period—showing kids how all the body’s parts and systems work “behind the scenes.” I thought that was a super idea, because the kids in my life are all so curious about their “innards,” and they also have normal worries about small injuries and minor illnesses. They want to know what makes them yawn or throw up, and why their ears pop sometimes. It is so important to answer kids’ questions in an age-appropriate way, and to nourish that natural curiosity. I had free rein to develop the plan for every single spread, and the publisher brought in expert artists to work with me and the editorial staff in developing the amazing artwork. I imagine writing a science book like that is quite challenging. How did you write such technical information in such understandable terms for a younger audience? Writing about technical stuff for any lay audience is challenging, and doing it for kids is the hardest of all. Not only do the facts need to be right, but the writing has to be bright and interesting, and the vocabulary has to work. Sentences have to be short, and the flow of ideas has to be crystal clear. When writing for children you have to be always thinking: which details are important, and which ones aren’t? I do a ton of tinkering to try to get all those things right, and I also try to use analogies that kids will get—relating some body process to something kids know about from their daily experience. For example, it’s pretty easy to visualize the blood cells moving through your arteries being like cars on a freeway. I like to make the titles of chapters and subtopics work hard, too. So instead of having a title say “the respiratory system” or even “breathing,” in A Day in the Life I have “Air In, Air Out.” Those four words are easy to read and they convey exactly with the spread is about. Finally, I think it’s vital to respect kids’ intelligence. While I know I have to make the material fun and interesting and easy to understand, I believe an author should never, ever talk down to kids. Well said! I review so many children’s book and am instantly turned off by patronizing prose. It is indeed difficult to write in the right tone for kids without talking down to them, and you certainly mastered that in your book. Who illustrated A Day In The Life of Your Body? The book’s line art is by very talented and knowledgeable artists at Argosy Publishing in Boston. I’ve worked with them on a couple of other projects, and they’re top notch. This book and the others you have written must take a great deal of time to complete. Well, I’ve been doing this kind of work for a long time, so it goes faster now that it used to. A Day in the Life of Your Body probably took three or four months, not counting production. When I revise Human Biology, we’re talking six months at hard labor. A book like The Shark Chronicles took more than a year, and I do mean 365-plus consecutive days writing. But I’m a workaholic. I do some kind of writing at least six days a week. It’s so important for writer wannabes to know just how much research, writing and rewriting work goes into drafting superior quality prose. You have shown us that it requires non-stop dedication and discipline. Do you have any thoughts on health education, which seems to be greatly lacking in the US? The U.S. public education system seems to be in disarray, especially in these difficult times of deep budget cuts. I have a stepdaughter who is an elementary school science teacher, so I know what hurdles and challenges she faces on a daily basis. As you know, many, if not most, school districts have felt they must curtail health education because it’s an “extra.” That puts the burden on parents to be knowledgeable about so many key health issues. If I were Queen of the World, I’d want young people to get at least some solid health education, especially in middle school and high school, in courses offered by teachers who’ve had some training in the field, just so kids and youth can have a better understanding of how things like regular exercise and proper diet and getting enough sleep are so important to their lifelong well-being. I’d want the classes to talk about illicit drug use and tobacco and sun exposure, too. I am fascinated by the books you wrote about sharks. Can you tell us about your journey writing The Shark Chronicles, which you coauthored with John Musick? My husband John (Jack) Musick is a college professor and a Harvard PhD in marine science. He is an internationally recognized expert on sharks and marine ecology. We’ve collaborated on several books for kids that deal with sharks and life in the oceans, including Insiders:Sharks! and Insiders:Oceans! published by Simon & Schuster. We also coauthored The Shark Chronicles, a book for adults on how Jack and other researchers around the globe have learned about all the different kinds of shark, how their body systems work, how they find prey, their amazing sensory systems, and so forth. Jack and I got the idea to do a book that takes readers to the actual places where shark researchers do their fieldwork, and then to use that to set the scene for describing shark biology and ecology. Our agent sold the project to Times Books/Henry Holt, and they gave us enough of an advance that we were able to travel all over the world—places like Japan and Bimini, Key West and Mexican fossil deposits—to see the research in action and interview the scientists. It was wonderful. The only bad part was that for the chapter Shark Worlds I had to interview Jack about his work on shark ecology, sitting at our dining room table for days and days, which was not so appealing! And at the end the schedule was so tight that I had to write for 120 days straight, including Thanksgiving, Christmas, and New Year’s. Your travel experience sounds fascinating, worthy of an interview on its own perhaps! What is your next writing project? I’m working on a novel in between revising my human biology text and another textbook I work on. Who knows where that will go, though! I’m also talking with a publisher about possibly doing another children’s book project. 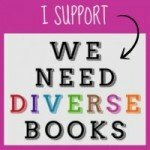 I’d love to read your next children’s book! What advice do you have for someone who is considering a career in science writing? Educate yourself and be ready to work very hard. Research the graduate science writing programs that are available, and if you want to go that route, plan on getting at least an undergraduate science degree, if not an advanced degree, first. Look for ways to begin publishing your work, whether it’s in your local newspapers, magazines, or online. You’ll need clips or samples of your published work to get almost any kind of science writing job. Be dedicated to accuracy, because in science writing, over time your reputation will be your calling card. Read every kind of science writing you can get your hands on, and learn from what others are doing. 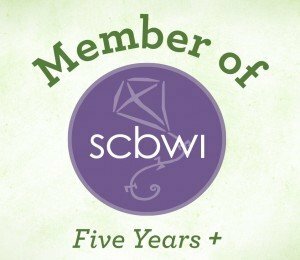 Network with other writers. From a pragmatic perspective, until you’re more established you’ll probably need some other way to make a living. I worked as an assistant project manager arranging signage for shopping centers and did freelance editing on the side. But if you are passionate about science writing and you put in the work, you can have a very rewarding and satisfying career. When you are not researching or writing, what do you enjoy doing most? I love to power walk and try to put in at least 15 or 20 miles a week. It keeps the brain lubricated, somehow. Jack and I enjoy spending time with our kids and G-babies. Both of us do sort-of gourmet cooking, and I bake all our bread. We have a simple cottage in a part of northern California where we go trout fishing and snowshoeing and hang out in the old hot tub under a redwood tree. I’m so grateful for all the good things in my life. And we are so grateful to you, Beverly, for taking the time to give us such thoughtful and meaningful answers to our questions. Your passion for science writing shows, and your work is so important to the future of science. To our readers, I highly recommend you purchase a copy of Beverly’s book A Day in the Life of Your Body for your children. It is an essential addition to your home library that can be used for reference over and over again. Your children will understand the basics of how the body works and how important it is to eat healthy foods and exercise – something they will not likely learn in school. 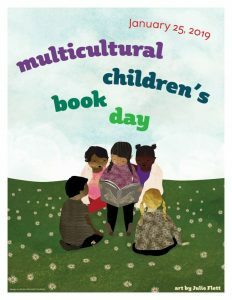 Click here to check Beverly McMillan’s other books. 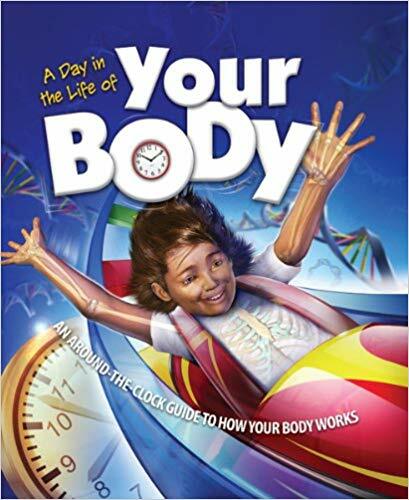 I am going to start my review of A Day in the Life of Your Body: An Around the Clock Guide to How Your Body Works ($14.99, Barron’s, ages 8 and up) by saying that I find this book to be overwhelmingly wonderful in every way. Think of it as a comprehensive anatomy textbook, but for kids – filled with extraordinary, detailed full-color medical illustrations and photographs. Author Beverly McMillan’s narrative takes the reader through what goes on inside the body of a child on any given day, from the time she wakes up until she goes to sleep. Young readers will learn an array of fascinating facts about how the body works. For example, the keratin in our skin makes it completely waterproof, the cerebral cortex of the brain is used to doing math problems and vision is the most powerful of the five senses. In addition to covering the vital functions of the body, other engaging sections cover visiting the doctor, genetics, how food is processed, what it takes to live a long and healthy life plus health myths and facts. interior illustration from A Day in the Life of Your Body by Beverly McMillan, B.E.S. Publishing ©2012. What I love about this book is that it is written in such a way that what would normally be complicated information is just so easy to understand. The exceptional illustrations clearly depict the internal layers of the body, which greatly complement the text. And it’s very important for our health, for all of us to understand how the human body works. This book may have been written for children, but you’d be hard pressed to find an adult anywhere who would not learn from it and enjoy reading it, too. Every home and classroom should have a copy of A Day in the Life of Your Body: An Around the Clock Guide to How Your Body Works! Reviewed by Debbie Glade, who adores science books, and was excited to review this spectacular book about the human body.